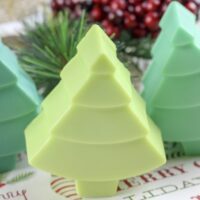 Easy DIY recipe to make homemade natural Christmas Tree Soaps with a festive pine scent! Do you love everything Christmas? I know that I do. In fact, I even decorate my bathroom for Christmas! Am I the only one? I think not. 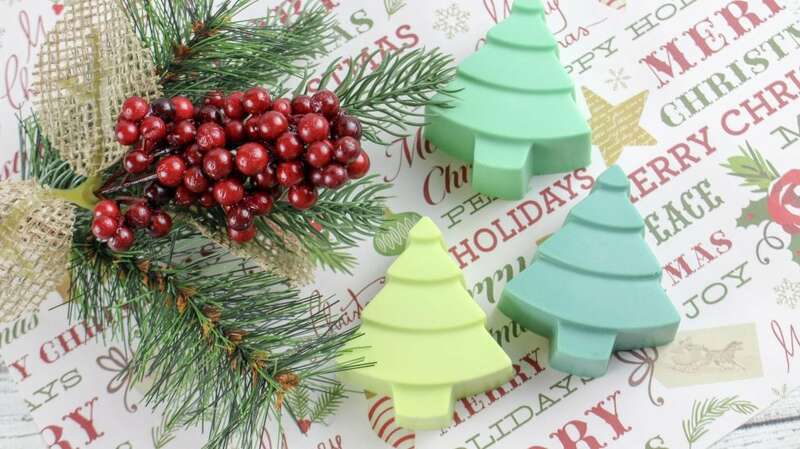 And when it comes to decorating every single room in your house for Christmas, you gotta have Christmas tree soaps in the guest bathrooms, kitchen, and master bathroom. It just completes the theme, am I right?! Or, maybe you love making handmade gifts for friends and family as presents. And you’re looking for something easy and fun to make. Natural soaps are a great idea, because everyone can use soap, right? 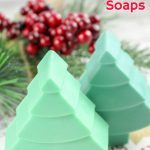 So whatever reason you’re thinking about making your own soap for Christmas, I can tell you that this simple DIY recipe with three ingredients does not disappoint! You’ll look like a rockstar by making these holiday soaps with a great natural pine scent. Sure, you can find a lot of soaps that are pine scented. But are you actually getting REAL pine scent? Or an artificial fragrance with lots of chemicals designed to smell like pine? The reason that essential oils are used in so many natural soaps and natural cosmetics is because they capture the real scent of a plant. Essential oils are compounds from the plant or other natural substance that are distilled down and create the “essence” of that plant or product. 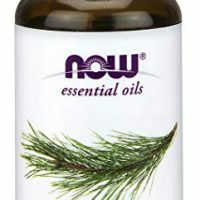 So, pine essential oil is really parts of a pine tree that have been distilled to create a real pine smell. Artificial fragrance, however, is not natural. It’s made of chemicals – often many chemicals – designed to mimic the smell of a plant or substance. So you’re not really smelling pine at all with an artificial fragrance. You’re smelling something designed to be similar to pine. What’s the big deal? Well, artificial fragrances can be made out of many chemicals, sometimes up to 1,000 in one fragrance! And those chemicals don’t have to be revealed due to laws that protect proprietary fragrances. This soap uses only three simple ingredients. And they can all be customized according to your preference. We used shea butter as the soap base. But if you’d prefer another type of soap base, such as natural glycerin, that works, too. Pine essential oil is the fragrance used in our Christmas tree soaps. But feel free to customize the scent with other essential oils. Choose one essential oil, or combine oils for a unique scent. Check out these wonderful scent blends for aromatherapy for the holidays. 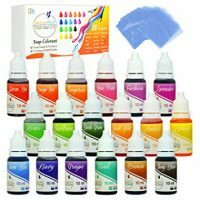 Coloring used for the Christmas tree soaps is a food safe coloring. Consider using mica powder for coloring soaps, too. Or you can leave them unscented. 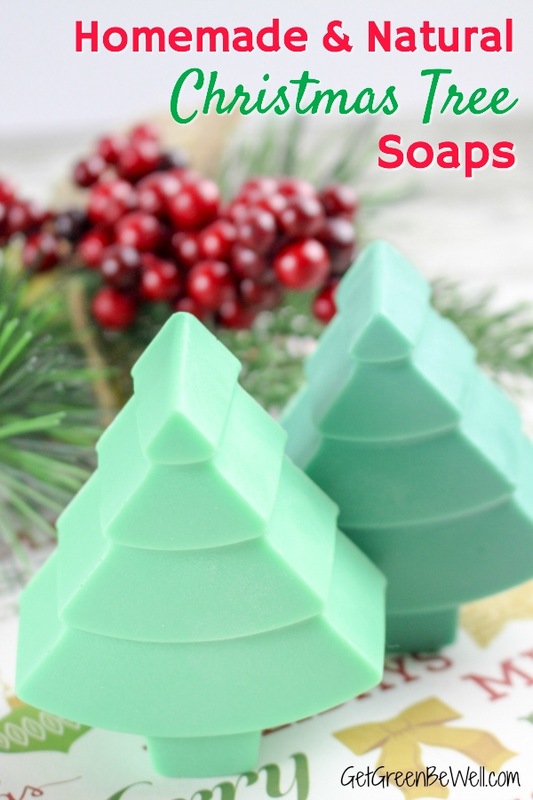 Natural Christmas tree soaps with real pine scent. An easy DIY microwave recipe using only 3 ingredients! Cut 12 cubes out of your melt and pour soap base (each cube should be 1 ounce). Make sure each cube is broken apart individually. Place 4 cubes in a microwave safe bowl. Microwave on HIGH for 35 seconds or until the soap is completely melted. Remove from the microwave and add 4-5 drops of dark green soap colorant and 10 drops of pine essential oil. Stir together. Immediately pour the mixture into 2 of the tree molds. Repeat step 3 again. This time, add 4 to 5 drops of lime green soap colorant and 10 drops of essential oil. Stir together. 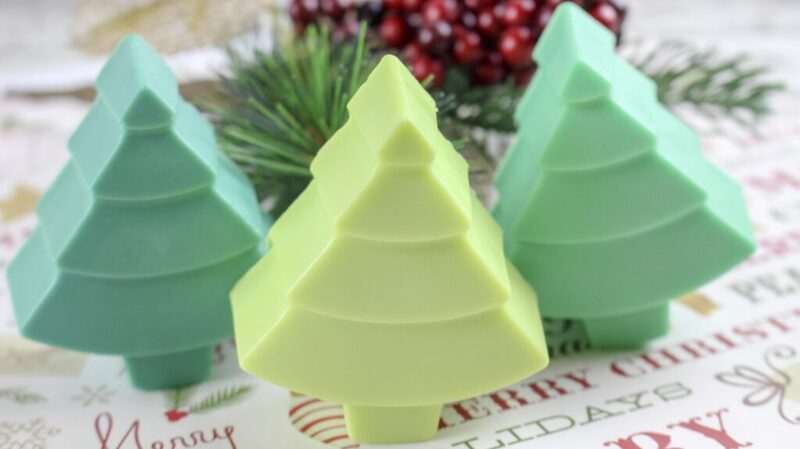 Pour into 2 of the Christmas tree molds immediately. Repeat step 3 one more time with the remaining 4 soap cubes. Stir in 4 to 5 drops of teal green soap color and 10 drops of pine essential oil and stir. Pour into remaining tree soap molds. Allow the soap to completely harden. This will take about 2 hours. For faster setting, refrigerate the soap for at least one hour. Gently pop out the pine scented tree soaps from their molds. 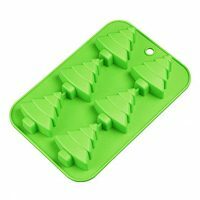 Efivs Arts 6 Christmas Tree Silicone Cake Baking Mold Cake Pan Handmade Soap Moulds Biscuit Chocolate Ice Cube Tray DIY Mold 10"